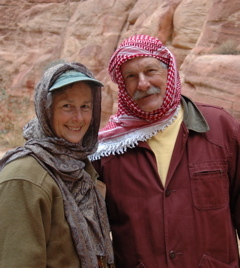 Chileno Valley ranchers Mike and Sally Gale several weeks ago returned home after spending a fortnight in the Middle East visiting their son Ivan, a newspaperman in the United Arab Emirates (UAE). 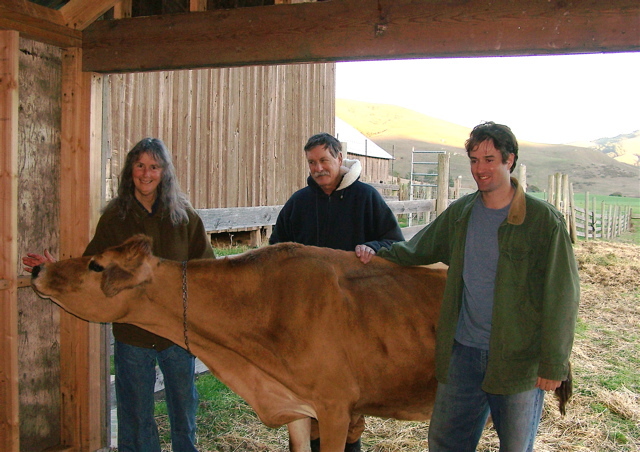 Sally, Mike, and Ivan Gale at their Chileno Valley ranch last Christmas. 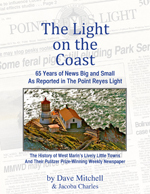 In 2003 and 2004, Ivan was an excellent reporter for The Point Reyes Light, winning three national and three statewide journalism awards during those two years. Ivan left The Light to attend Columbia University’s Graduate School of Journalism and earned two master’s degrees in Communications, one with a specialty in Science Reporting. From there, he managed to land a job in the UAE, where for two years he was a business reporter for The Gulf News in Dubai. The transportation industry was his main beat. Ivan, now 33, this month will begin a new job with a startup daily in Abu Dhabi. Maps from the World Fact Book, which is posted by the CIA. 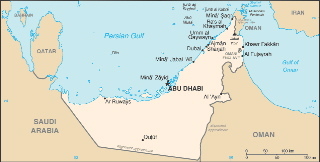 The UAE is a federation of seven states on the eastern side of the Arabian Peninsula: Abu Dhabi, Ajman, Dubai, Fujairah, Ras al-Khaimah, Sharjah, and Umm al-Quwain. 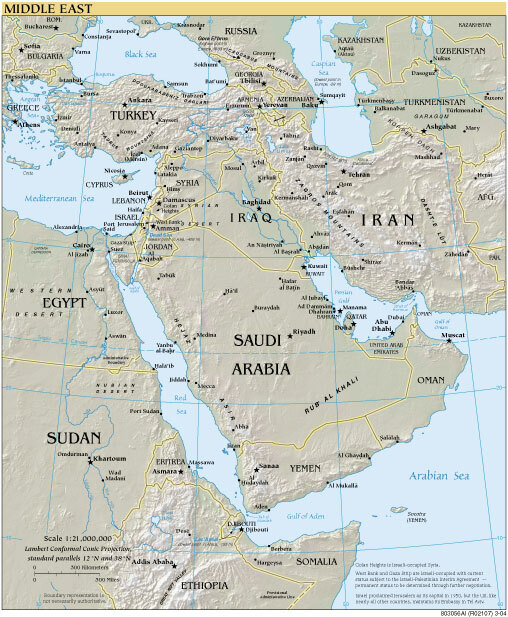 The federation’s neighbors are Saudi Arabia and Oman while across the narrow Strait of Hormuz lies Iran. The emirates are shown to the upper left of Oman on the right side of Saudi Arabia. A federal constitutional monarchy, the UAE’s presidency is always held by a member of the Al Nahyan clan of Abu Dhabi and its premiership by the Al Maktoum clan of Dubai. The Supreme Council, which consists of the rulers of the seven emirates, elects a Council of Ministers. 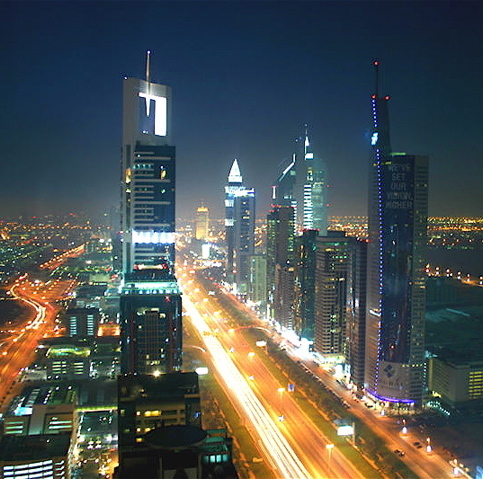 Thanks to oil and natural-gas revenues, which in turn have fueled other industrial development, the UAE has the fifth highest Gross Domestic Product per capita in the world. A whopping 85 percent of the UAE’s population of 4.5 million are non-citizens. Along with residents from other Arab countries, there are 2.15 million South Asians (mostly Indians, Filipinos, Pakistanis, and Bangladeshis plus several thousand Sri Lankans). In its report on Human Rights, the US State Department annually complains about abuse of South Asian workers in the UAE. And while acknowledging improvements in recent years, the State Department also reports the UAE’s Islamic fundamentalism can be harsh. These criticisms notwithstanding, Islam in the emirates is far less fundamentalist than in such neighbors as Saudi Arabia and Iran. And the UAE is definitely friendly to the West. From 1892 until 1971, its states were by treaty under British military protection. In 1990-91, the emirates joined the fight against Saddam Hussein in the First Gulf War, which followed Iraq’s invasion of Kuwait. 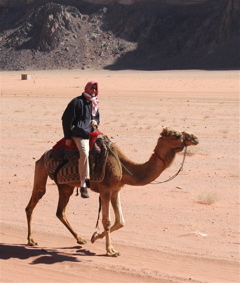 During his parents’ visit, Ivan (at left) accompanied them on a trip to Jordan, which is across the Arabian Peninsula from the UAE. Included here are two photos from that trip. While Sally like other women was expected to wear a headscarf, Ivan and Mike are wearing them to ward off a cold wind. Because the emirates are Arab states ruled by sheiks, with each state having both secular and Islamic law, I found myself wondering what is it like for Ivan to live and work in this world — especially when he doesn’t speak Arabic. And for that matter, why are there several English-language newspapers in the UAE? DVM: What can you tell me about the newspaper where you’ll be working? Ivan: The National is set to launch on April 17 and will be a nationwide, general-interest, English-language newspaper. 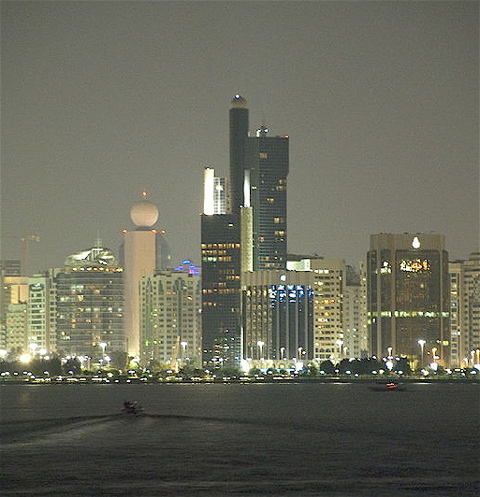 We will be the only English daily based in Abu Dhabi [above], the UAE capital, but there are a handful of other English dailies based in Dubai and Sharjah. A lot of newspapers have done well here because the real estate market (and the economy as a whole) is so hot it is keeping the advertising market extremely buoyant. Our newspaper is funded by the Abu Dhabi government which is reshaping its media subsidiary (and our parent company), Emirates Media Inc., into Abu Dhabi Media Company. ADMC’s CEO is Ed Borgerding (formerly executive vice president of Walt Disney International in Hong Kong and senior vice president of Walt Disney International Television in Hong Kong and London). Our newspaper is the first and most significant new initiative from the Abu Dhabi government’s media arm, which has some pretty ambitious plans for the future. DVM: Why is it possible for an English-language paper to survive in the Arab world? high numbers of foreign workers living here. There are some other [English-language newspapers in the Arab world]: The Daily Star in Lebanon and some newspapers and business magazines in Cairo, where English-language publications have established themselves. But outside the UAE, I don’t think you will find the same conditions of a booming economy and a critical mass of English readers that have spelled success for the local dailies here. Outside of the commercial aspects, I think local publications provide an important service for English readers living outside the region. There is a growing hunger among readers in the East and West [for news] about what is happening in the Middle East, and this will mean online readers will increasingly consult the websites of UAE newspapers for news and analysis. DVM How many English-language newspapers are there in the UAE? IVAN: 7 Days (daily freesheet), Gulf News (daily broadsheet), Khaleej Times (daily broadsheet), Emiates 24-7 (daily tabloid business newspaper), Xpress (free weekly newspaper), Gulf Today (daily broadsheet), and soon The National (daily broadsheet). I should also note that The Times of London began printing an edition in the UAE last year, and The Financial Times does as well, I believe. DVM: How much of the English-language press’ readership in the UAE is from India? Ivan: It has been said that some newspapers cater almost exclusively to the South Asian segment of the population. As a block they could very well constitute the single largest group in this country. It’s probably true that some of the English newspapers rely on this group for at least half or more of their readership. But there are also large numbers of expats living here from the UK, Europe, and North America. A lot of Arab businessmen also consult the English press for news and analysis too. So it’s definitely a mix. DVM: What fuels the UAE economy? Ivan: A brief answer would be high oil prices which spill over into a booming real estate market, high consumer spending, and the relentless pace of infrastructure mega-projects [built with] private and government… investment. Travel and tourism are also very important. DVM: I gather you’ll be covering transportation. Why is that a major beat in the UAE? IVAN: The thing is, there are many major beats here because the UAE government — and Dubai [above] in particular over the past five years — have undertaken an ambitious and wide-ranging diversification campaign. So there are exciting developments going on in real estate, finance, telecoms and technology, travel and tourism, media and marketing, and of course oil and gas. But it is important to note that transport was the first major industry that put this country on the map after its pearling industry collapsed. Dubai borrowed heavily to dredge its creek and then build a deepwater port around the 1950s — before the country’s oil and gas reserves were discovered. DVM: Under Islamic law, Muslims are not allowed to drink alcohol. What are the UAE’s laws on drinking as they apply to you? Ivan: It is legal to buy from a licensed liquor shop if you have an alcohol license. You can also buy from the duty free shops at the airport when you arrive. In some emirates, there are hole-in-the-wall shops where you don’t have to have a license. DVM: How much Arabic do you speak? How do you get along — both at work and around town — without being fluent? Ivan: I’ve picked up greetings and how to exchange pleasantries but never studied the language. And I’ve never felt that I was any worse for it. The Emiratis and the Arabs from other countries who live here all speak English with varying levels of fluency. People in the service industry are invariably from the Philippines or South Asia. Frankly, this would be a tough place to study Arabic because there is no immersion experience. English is read and spoken all around you. What a great opportunity. Way to go, Ivan. Yet another example of how under Dave’s tutelage a young journalist has gone on to great things. Sparsely Sage and Timely is powered by	WordPress 4.9.10 and delivered to you in 0.430 seconds using 52 queries.